Crossrail awards last railway systems contract - Crossrail . For information about the Elizabeth line please visit the Transport for London website. Crossrail Limited today announced that it will award the contract for the provision of platform screen doors to Knorr-Bremse Rail Systems (UK) Limited. The award of the platform screen doors contract is the last major railway systems contract to be awarded by Crossrail. The contract covers the installation of full-height platform screen doors at Paddington, Bond Street, Tottenham Court Road, Farringdon, Liverpool Street, Whitechapel, Canary Wharf and Woolwich Crossrail stations. The total length of platform screen doors to be supplied for Crossrail is 4km. The supply of platform screen doors will be undertaken by Westinghouse, a specialist division of Knorr-Bremse, with facilities based in Melksham, Wiltshire and at Wolverton near Milton Keynes. 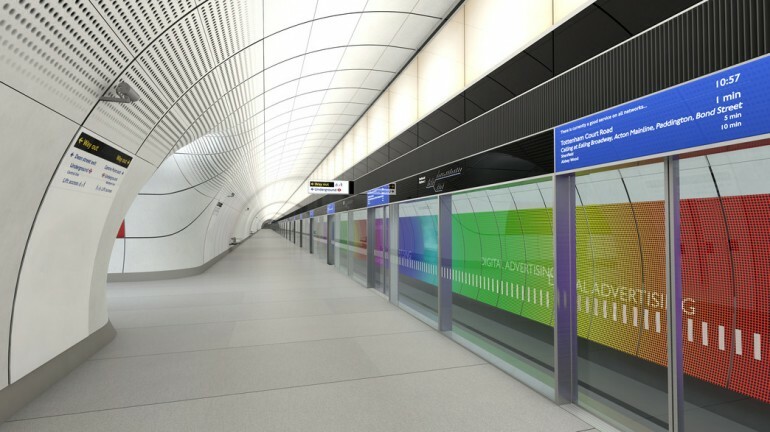 Knorr-Bremse has confirmed that the platform screen door system for Crossrail will be designed and developed at Melksham, Wiltshire along with the manufacture of the electronics and operating system. The assembly and testing of the Crossrail platform screen system will take place at their Wolverton rail facility near Milton Keynes supporting the growth plans that Knorr-Bremse has earmarked for their Wolverton site. The value of the C631 platform screen door contract is in the region of £28m. The platform screen door system will be integrated with the platform edge screen which will sit above to fully enclose the platform. C610 Main Works Tunnel Fit-out: Joint Venture comprising Costain Ltd, TSO and Alstom Transport. The scope of work covers the fit-out of the Crossrail tunnels with the necessary track, overhead power equipment and services to enable Crossrail trains to operate from 2018. This will include the installation of over 40km of track, overhead electric conductor rails to power the trains as well as ventilation and drainage systems. The C610 Systemwide main works contract incorporates the C630 Tunnel Mechanical & Electrical Systems contract. C620 Signalling System: Siemens PLC. The contract covers the design, manufacture, supply, installation, testing and commissioning of a train control system for Crossrail’s central section. C644 High-voltage Traction Power Supply: AC Joint Venture (Alstom Transport and Costain Limited). The scope of works includes the provision of traction power to power rolling stock within Crossrail’s central section extending from Royal Oak Portal in the west to Pudding Mill Lane in the east, splitting at Stepney Green Junction and running to Plumstead Portal in the southeast. C650 Non-traction High Voltage Power Supply: AC Joint Venture (Alstom Transport and Costain Limited). The scope of works includes the provision of electrical power within the central section to Crossrail stations, portals and shafts. C660 Communications and Control System: Siemens PLC. The scope of works includes the design, testing, installation and commissioning of key communications and control systems within Crossrail’s central section including CCTV and public address systems at stations, customer information displays, staff and emergency services radio systems and the data networks that will carry information to and from the route control centre. The total funding envelope available to deliver Crossrail is £14.8bn. The Crossrail route will pass through 40 stations from Reading and Heathrow in the west, through new twin-bore 21 km (13 miles) tunnels to Shenfield and Abbey Wood in the east.